‘Thanks for the question, Dan. 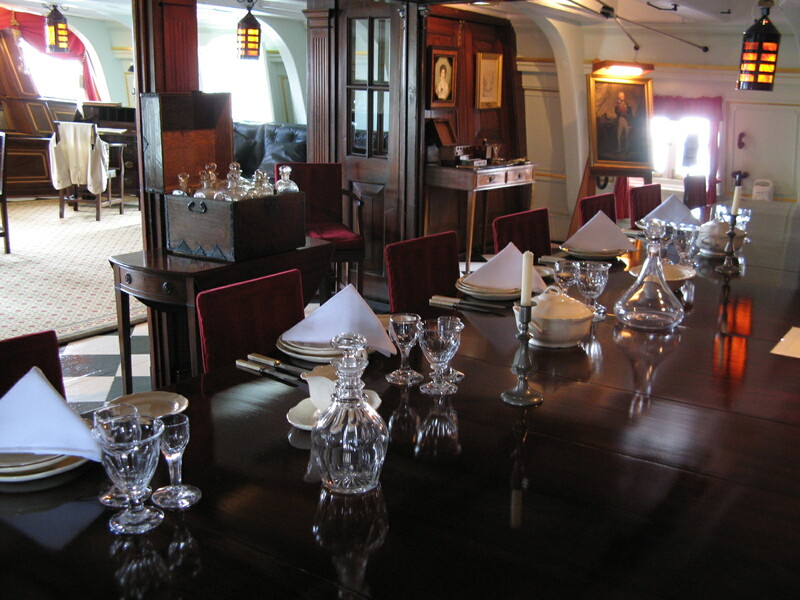 Wardroom officers were entitled to the ordinary ships’ provisions provided for the seamen – unless they decided to subsidise their meals from their own pocket, which they almost invariably did. This was done by appointing a mess treasurer, who was responsible for ordering in extra stocks of food and wine, tea, sugar etc. It could be quite expensive – in Kydd’s day around £60 each per annum. Sometimes members of the mess who did not have private means (or prize money) were hard pressed to come up with their subscription! Officers dined in some style. They were drummed to dinner to the tune of ‘Hearts of Oak’. As was the case ashore, dinner was in the ‘French service’ – a number of dishes (sweet and savoury) were placed on the table for each ‘course’. The officers had their own cook; he was often quite skilled. With the advent of the Brodie Stove, the officers’ cook could produce pretty much what could be found at any fine table ashore. Meals were served on a linen tablecloth with silver, candles and good china. Each officer had his own personal servant whose duty was to stand behind him and wait on him. The captain dined alone, unless invited to be a guest of the wardroom mess. The Georgian cookery writer Hannah Glasse devotes a whole chapter of her book, ‘The Art of Cookery’ to pickles, sauces, pies and other dishes ‘suitable for captains of ships’. The first entry is a recipe for ‘catchup’ that will keep 20 years! Do you have a question for AskJules? You can email me or send it via the Comments Box below. I’ll answer as many as I can in future blogs. I appreciate all info on cooking at sea. It is a very interesting subject. What I always find amazing is the in all my years at sea, I have spent more time holding onto the plates and and glassware than I spent actually enjoying the food. In the age of sail, with between the weather and the striking down of the cabins for quarters, I can’t imagine how much glass they went through and how they were able to replace it in far flung places. Hi Julian, I think the title of the tune you mention is Heart of Oak, not Hearts as often used in error. In my time in the Royal Marines, 1948-82, the dinner dine-in tune was always Roast Beef of Old England in wardrooms and officers` messes ashore. Quite right, Terry – slip of the finger typing! And in Kydd’s day it could have been ‘Roast Beef’ also – was always a ‘sprightly air’ and generally at the whim of the officers. The process of mess subscriptions continues today and extends to Senior Ratings Messes (Chief Petty Officers and Petty Officers), who also run their own bars. The subscriptions are decided and agreed at mess meetings and managed by a mess treasurer. They are spent on ‘comforts’ such as condiments and furnishings not available through naval stores. Each rating is also allowed a daily beer allowance which is often not consumed at sea due to diligence and watchkeeping, but the allowance is wiped clean each time they sail, so the allowance is used for mess guests whilst alongside. Gangplanks are very unstable on descent!